Not locals? No problem! We will come to you. We specialize in web design and development, SEO, PPC advertising, and web site optimization. - NO Contracts Required, NO Gimmicks! - Unlike most web services companies, we own and operate several web-based business directories. With our extensive experience in the web and marketing industry, there's nothing we can't handle. We have clients in Morocco, the U.K., and most of the continental United States. Join us in growing your brand and reputation online today! Now Celebrating Our 20th Year in the Business! Not locals? No problem! We will come to you. We specialize in web design and development, SEO, PPC advertising, and web site optimization. Our industry leading staff has the skills and expertise to not only build your web presence, but effectively market your site to generate traffic. eNet develops, repairs, and builds websites to suit our clients' needs. 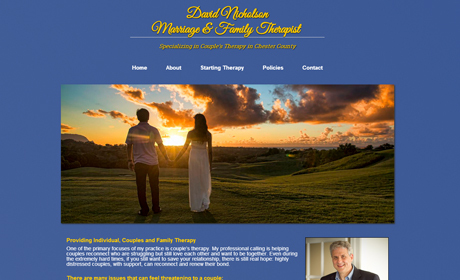 From an individual blog to a corporate website, we promise the same high quality care to every one of our clients. Our SEO experience allows us to optimize your website's results for Google, Bing and Yahoo. Once you are a client of ours, you will receive full benefits by participating in our directories. Unlike most web services companies, we own and operate several web-based business directories. 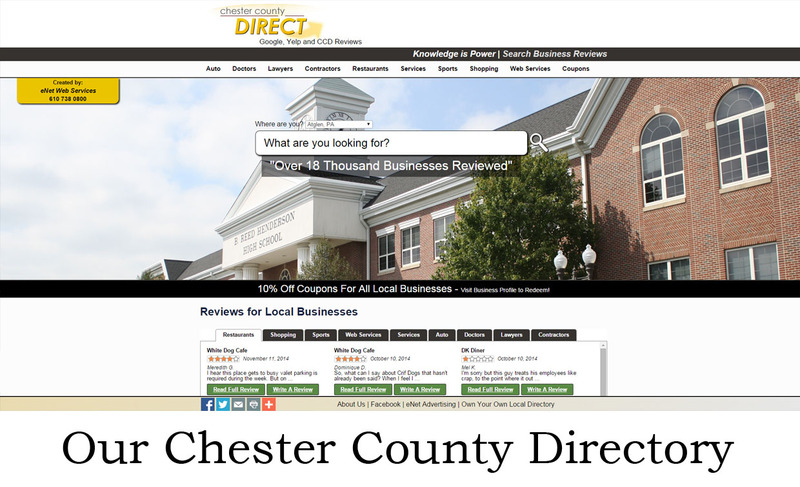 Listing in these directories can boost traffic, SEO impact, and generate leads. Directory listing is free for all eNet clients. eNet Advertising can handle projects of any size, and we have competitive pricing to match any budget. We are a full service web company and can handle everything from web design to SEO and PPC management. Ten Off is the leading app for local business coupons. Ten Off offers 10% off coupons for all participating local businesses. Designed and developed by eNet Advertising, Ten Off has become a hit on the App Store! 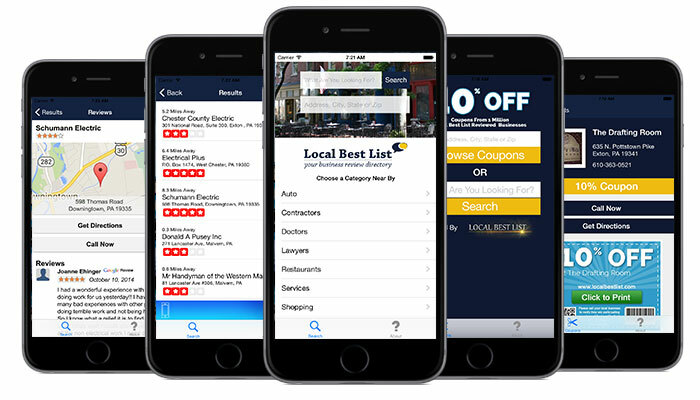 Local Best List Reviews was designed and developed by eNet Advertising to bring together reviews for local businesses in one easy to use app. 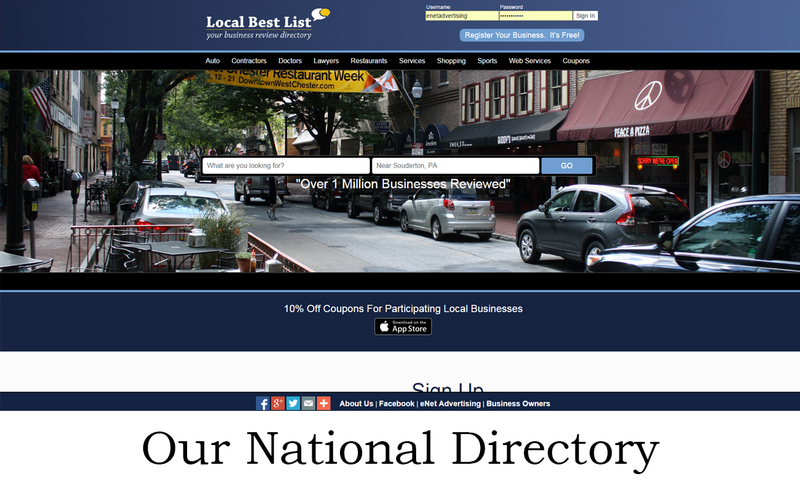 Users are raving about how easy it is to find the best local businesses with LBL Reviews. Choose eNet Web Services and Claim your top spot placement on our Mobile Directories and Apps. Consumers can very easily search over one million business reviews and ratings as fast as their fingers will allow. The new LBL Reviews and 10 Off Coupon Apps prove "Knowledge Is Power." eNet owned and operated apps help your business grow and are free to business owners as well as consumers. LBL is the number listed Contractor Review App for Apple. Update your business details, including hours, coupons and see all your reviews from Google and Yelp on one profile page. Fast track your top position by getting engaged with our Web Services. State-of-the-art website design, and the power to operate with any budget. Check out our Portfolio to see some examples of our work! Pay-Per-Click advertising provides the best ROI of any online advertising. Target customers with keyword specific ads and generate qualified traffic. Rank higher in Google searches! eNet Adsvertising can optimize your new or existing site to score in Google, Yahoo and Bing search results. Don't miss out on the growing importance of social media! Let eNet Advertising build your social media presence on top sites like Facebook and Twitter. Sell your products online with a high ROI eCommerce site! Web build online stores that convert. Sell more products with eNet Advertising. Need a quick video segment highlighting the benefits of your product or service? We create professional videos to top off your online marketing strategy. If you host your website with us you get up to 5 individual email addresses such as Chris@YourDomainNameHere.com. Click Here to log into your email. Have your competitors created fake accounts to ruin the reputation of your business? This is a growing tactic that we can help you fight.